The leaves look like IVY. What is this please help?? Those do look like ivy, or Hedera helix, but they're obviously not, based on the veining, and the thickness of the leaves - good call! Variegated Flowering Ivy, or Senecio macroglossus is a likely culprit, especially as it's described as resembling English Ivy. This one doesn't even have a common name, but it looks very similar to your example. It's known as Senecio oxyriifolius subsp. tropaeolifolius, but don't say this three times fast, your tongue will never be the same. From the picture, I'd say this is the culprit! 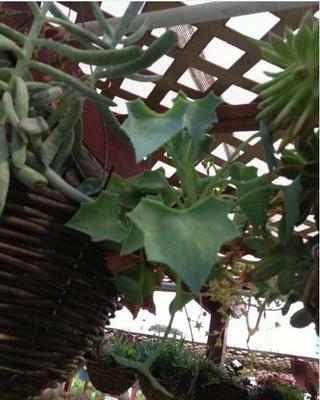 Comments for Please help ID this looks like ivy in succulent basket! I can't find any reference to a common name of Dragon's Tail for this plant - or any plant, come to that. This is why botanical Latin names are so important, even if they are tongue twisting.